The last time I visited Las Vegas I dined almost exclusively at rather pricey haute cuisine restaurants. This time around I was on a tighter budget so, with Templeton Peck in tow most of the time, I decided to chow down on just burgers. 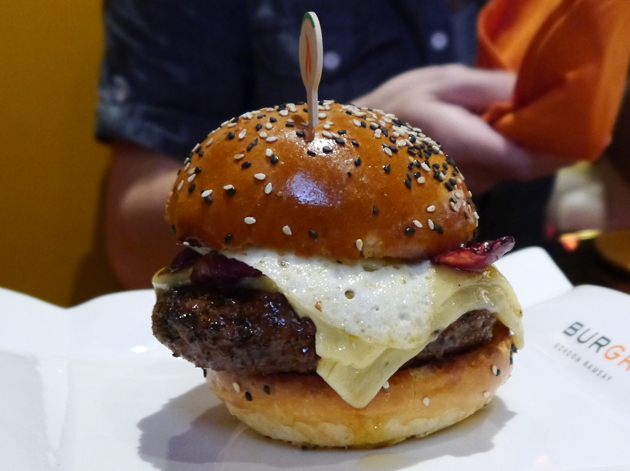 This isn’t an attempt to replicate the systematic, almost exhaustive survey I conducted of London’s burger eateries – more of a meandering, gut-busting gastronomic travelogue around the Strip. Almost everything in Las Vegas is a replica of something from somewhere else, whether you realise it or not. BLT Burger inside the Mirage hotel is a good example – what seems like a Vegas original is actually a spin-off of a New York restaurant. I immediately started having doubts about having dinner at BLT upon spotting lamb burgers and a staggeringly long list of other non-beef options on the menu, but I needn’t have worried. Templeton Peck and I shared a starter of deep fried dill pickles. Each slice was coated in a slightly crisp and fluffy batter. It was a touch oily, but not excessively so and didn’t get in the way of enjoying the moist, dill-flecked vegetable underneath. 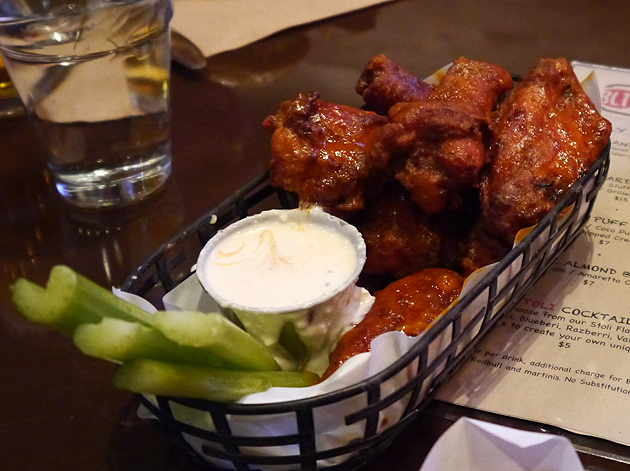 The buffalo wings had an intensely aromatic whiff of tabasco sauce. However, while each wing was meaty, moist and coated in a slightly thick, even layer of crisp batter, the spiciness was modest at best. 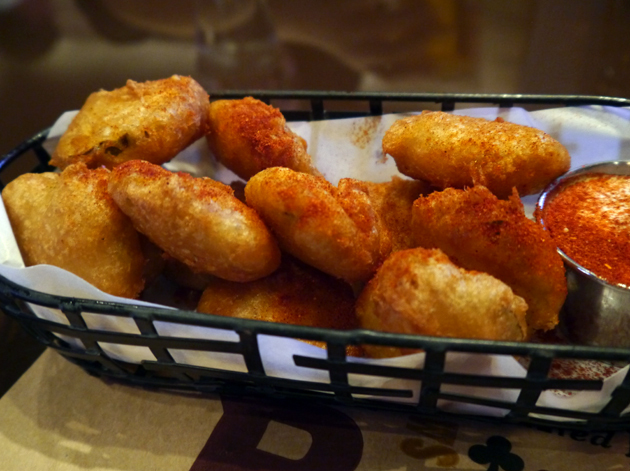 They also couldn’t compare to the intensely tender fattiness of the wings available at Patty and Bun back in London. I was pleasantly surprised by the quality of the smoothly ground beef patty used in the Classic burger. While not especially succulent, it was moist, tangy, lightly smoky and sweet. The vegetables were crisp and refreshing, while the bun held everything together and stayed out of the way. Simple, but largely effective. ‘Classic’ – the less dumpy relative of ‘normal’, ‘standard’ and ‘plain’. Templeton Peck opted for a Cowboy burger which used the same patty as the Classic but with the addition of barbecue sauce, ‘tobacco’ flavoured onions, cheese and bacon. Sadly, the intriguing tobacco onions tasted nothing of the sort, but the lightly smoky barbecue sauce didn’t overwhelm the taste of what was essentially a sweet and fatty bacon cheeseburger. The cowboy had some hot meat between those buns. The waffle fries may look and sound odd, but their crisp fluffiness isn’t a million miles away from the usual deep-fried potato-based burger accompaniment. The main difference here was the odd flat, wide, griddle pan shape. A cute gimmick, nothing more. 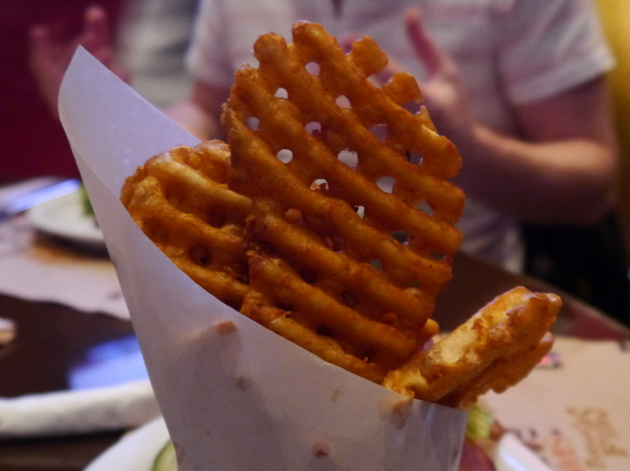 Waffle fries? What next? Waffle falafel? The onion rings were a disappointment. While whole slices of mildly sweet onion were used, it was hard to appreciate them as they were buried under a thick layer of doughy, bland batter. Although a range of desserts are available, those with less capacious stomachs would likely be more than satisfied with one of the voluminous milkshakes. 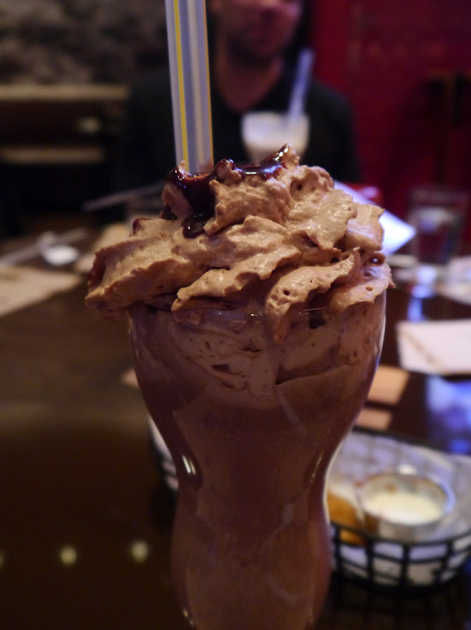 Although the thick chocolate shake is topped with a large mass of chocolate whipped cream and then drizzled with chocolate sauce, the actual chocolate flavour is unremarkable and muted at best. 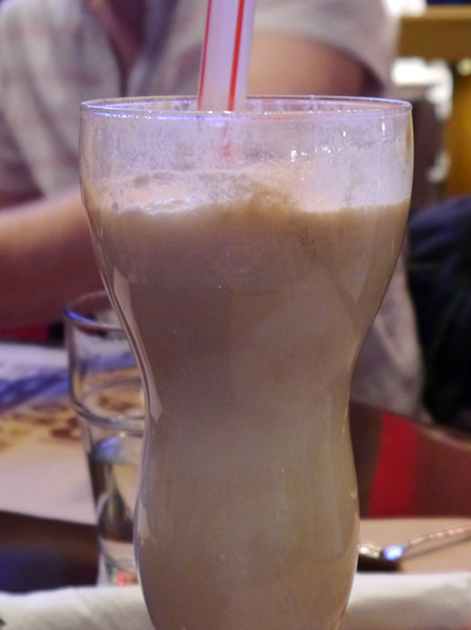 As is increasingly common at burger joints on both sides of the Atlantic, a selection of ‘hard’ alcoholic shakes are also available. Templeton Peck opted for the Dark and Frozen, where some dark rum was topped with layers of ginger beer and vanilla ice cream. It apparently tasted exactly as you’d expect it to – although Peck enjoyed the Dark and Frozen, it wasn’t interesting enough that he’d have it again. 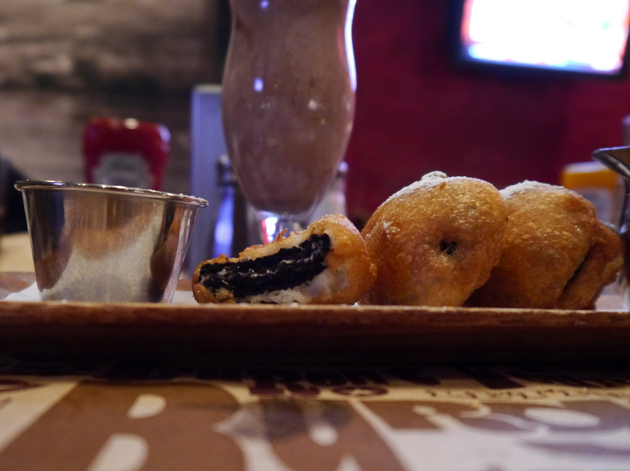 Templeton Peck couldn’t find room for a proper dessert, but my interest was piqued by the deep-fried Oreos, a dish that would no doubt make Elvis’ heart swell with pride and quite possibly cardiac arrhythmia. 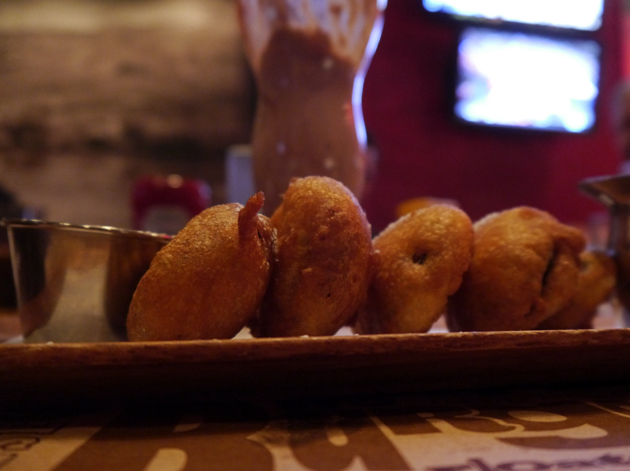 The slightly crisp, fluffy batter of each slice was essentially identical to that used in the deep fried pickles, but instead of a slice of vegetable at the centre of each one, there was a warm Oreo cookie that had been rendered soft and downy by the heat of the cooking oil. Although it looks and sounds odd, the smooth, soft textures made these Oreos far better than the usual off-the-shelf varieties. The wispy vaguely vanilla-flavoured dipping sauce was a pleasing accompaniment, but the bland chocolate dipping sauce wasn’t worth bothering with. They really will deep fry anything in America. Far tastier then it has any right to be. Apart from a massive red ornament dangling over the kitchen, the decor isn’t especially interesting. The front of the restaurant which faces out onto the Mirage’s shopping promenade is especially characterless, while tables further inside have to contend with the ever present Vegas hallmark of multiple flatscreen TVs showing sports. Service, while not especially warm or friendly, was at least efficient and quick. I visited the Mandalay Bay’s Burger Bar before back in July 2011. Like many other eateries in Vegas, the Burger Bar has the feel of a sports bar with its dim lighting and numerous screens showing sports. The service on my weekend lunchtime visit was friendly and started out reasonably efficient, but became increasingly unreliable and slow as the place filled up with rowdy football fans. 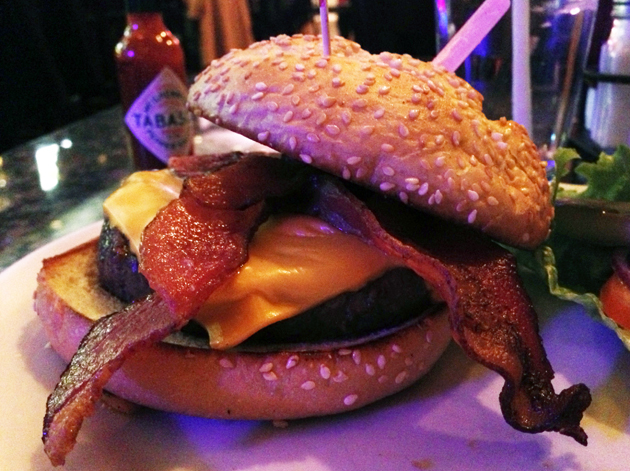 The American Classic bacon cheeseburger is the closest thing the Burger Bar has to a plain burger. 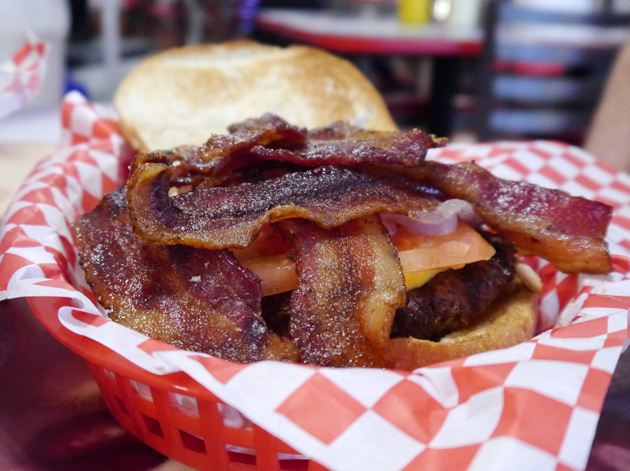 The sharp onions, lettuce, pickles and icy tomatoes are served on the side, while the lightly toasted bun is unobtrusive and holds the half-pound patty, the American cheese and the two streaky bacon rashers together well. 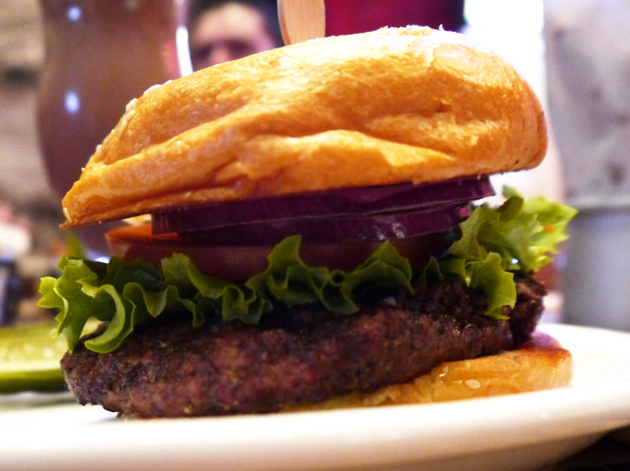 The patty isn’t bad, but it’s not as accomplished as its counterpart at BLT Burger. Cooked medium rare, the moderately coarse patty is mildly tangy and reasonably moist with a slight chewy edge. There’s little to say about the American cheese. The fatty bacon did have an initial hit of smokiness, but this quickly subsided. When in doubt, add cheap pork and even cheaper dairy. 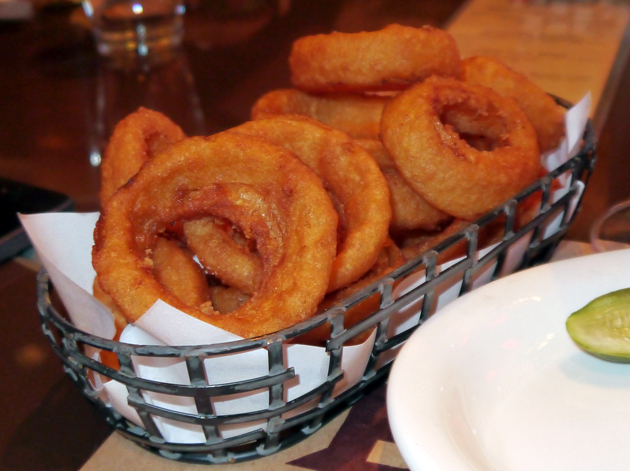 Buttermilk onion rings sound enticing, but the reality was a slightly oily, thick, crunchy, stodgy batter that was hard going. The batter also obscured the sweet moistness of the sweated onions underneath. Was it the buttermilk’s day off? 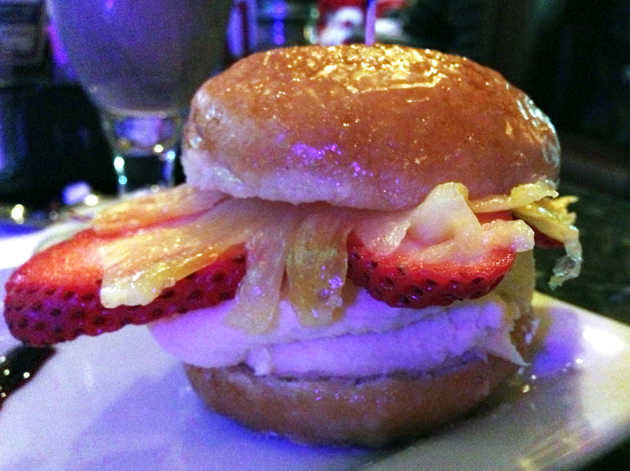 The Burger Bar has a couple of quirky burger-shaped desserts. This time around I opted for the burger cheesecake, but its construction wasn’t as elaborate or as whimsical as the dessert burger I had last time. The buns are actually a pair of firm, glazed doughnut slices. Sandwiched in between was a dense tab of reasonably creamy cheesecake as well as slices of pineapple and strawberry. It’s not a bad dessert, but not only does it taste unremarkable, it’s also not nearly as fun as it should be. Not a cheeseburger, a cheesecake burger! Gordon Ramsay is just as much a celebrity in the United States as he is in Britain and nowhere in America is this more evident than Las Vegas. The angry blonde’s empire is slowly expanding across the Sin City with a steak restaurant, a recreation of an English pub and now a burger restaurant set within the Planet Hollywood hotel. 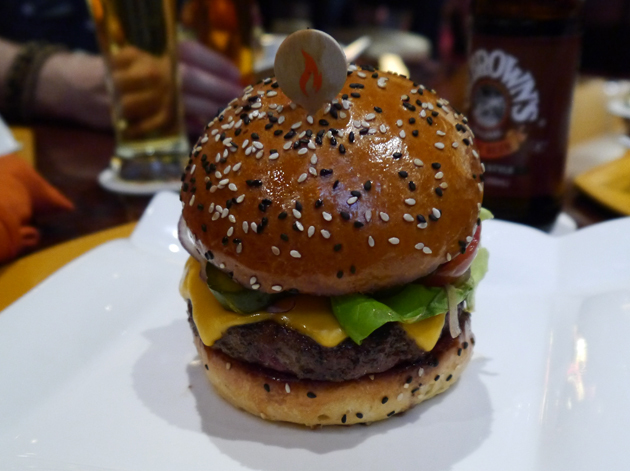 The worldwide Planet Hollywood franchise of restaurants are known for their lacklustre burgers, so the hotel’s decision to bring in a Ramsay-branded burger restaurant is an intriguing one. Even more curious is the layout of BurGR (a play on Ramsay’s initials) – the boundary between the brightly lit, colourful dining room/bar and the hotel lobby is a blurry one with only a few partitions separating the two. Service was, as expected for Las Vegas, a well-oiled, efficient machine. We were seated with our orders taken and drinks on our table within five minutes of stepping through the door. Interestingly, a vast beer menu was available on an iPad temporarily deposited at our table. Czech Republic and Gangster Limp opted for the safe choices of a Coors and a Stella Artois, while Templeton Peck went for a Sam Adams ale instead. 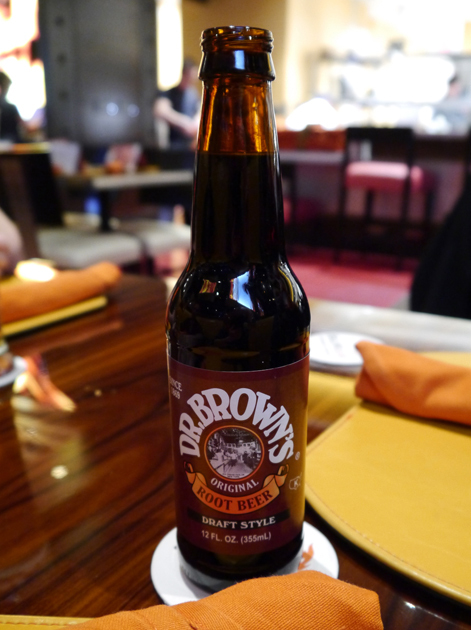 I settled on a root beer, which was rather muted at best. What can be more American than root beer? As usual I opted for the plainest burger on the terrifying-looking menu to see how well the kitchen coped with the basics. 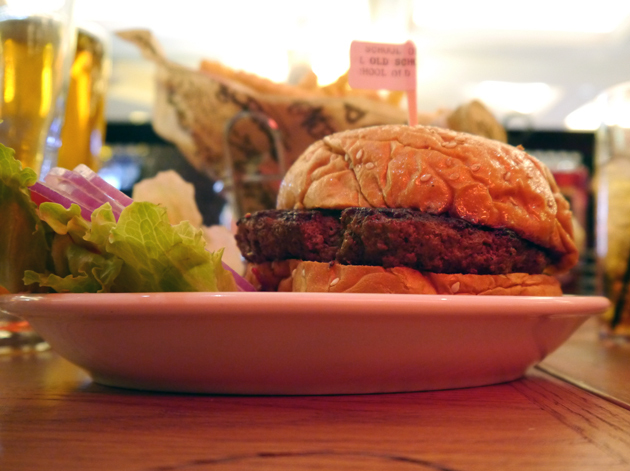 In this case it was the American Burger – a medium rare patty topped with American cheese, ‘butter lettuce’, tomato, pickle and onion. The coarsely ground patty was lightly seasoned, moist and mildly tangy with a subtle but evenly sweet, smoky effect, but these characteristics were overwhelmed by the thick, airy bun which got in the way of the meat. The vegetables were mostly unremarkable, but there was the distinctive tang of excessive salt – this could’ve been in the cheese or the ‘butter lettuce’. Either way it was unnecessary and slightly unpleasant. Well, a burger I guess. Czech Republic, Templeton Peck and Gangster Limp all opted for the Farm Burger, where a patty had been topped with duck bacon, cheddar and a fried egg. However, they respectively chose to have their burgers cooked rare, medium rare and medium respectively. Gangster Limp’s burger arrived medium rare rather than medium, but he, along with the other two, enjoyed the richness added by the egg, the moistness of the tangy patty and the creaminess of the cheddar. I thought Czech Republic’s rare patty was a little on the bland side with the egg and dense, soy-like salty bacon providing most of the flavour, but he was adamant that the flash cooking preserved more of the meat’s flavour. We may have differed in our opinions when it came to the burger, but we were all unanimous in our disapproval of the fries. These curiously flat fries were incredibly dry and tough – the provided ketchup and other condiments were essential for successfully holding down these cardboard-like bits of potato. 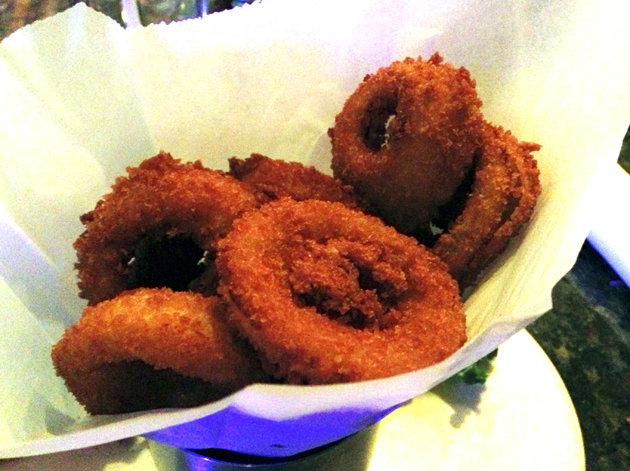 A close second in unpleasantness were the onion rings. Although whole rings of onions gently sweated were present, they were covered in a thick, doughy batter and an excessive amount of sickly parmesan which obscured both their taste and texture. 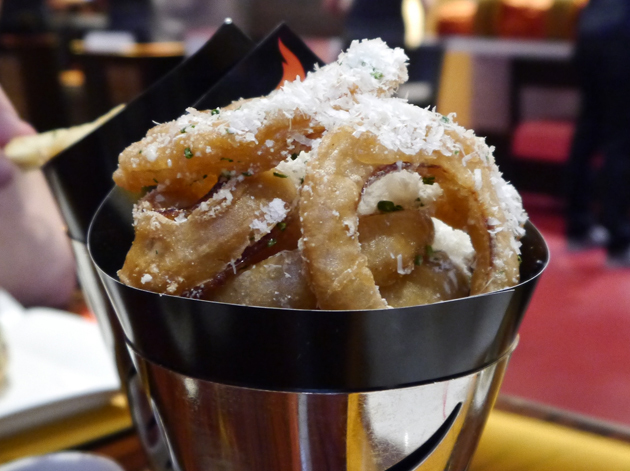 As expected for the US, the portion sizes of both the fries and onion rings were of planetary proportions – there was more than enough to share between the four of us. Rings of power? No, not really. My three dining companions were satiated, but I found just enough room for the Shake No. 1 – a mixture of caramel pudding and chocolate milkshake topped with a toffee cookie. 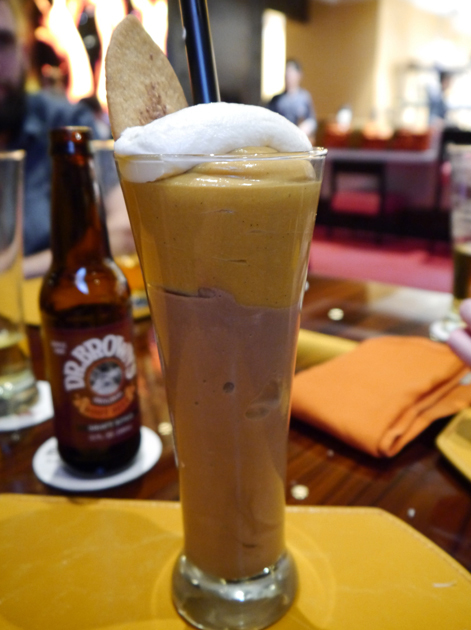 The massive dessert in a glass was almost inedible though – thick layers of sickly sweet sludge sitting on top of each other with a bland biscuit and a dense cream sitting on top. Thanks, but no thanks. The Exxon Valdez has nothing on this mutha. Las Vegas is all about excess. Apart from the hotel buffets, I can’t think of any restaurant more excessive then the Heart Attack Grill. Located in downtown Vegas not far from the Fremont Street Experience, this diner flaunts the heart stoppingly unhealthy nature of its food on its sleeve loudly and proudly. 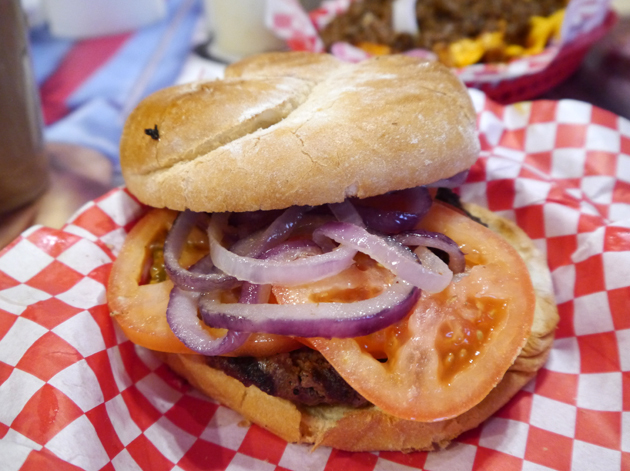 The Heart Attack Grill’s flagship dish is the quadruple bypass burger, a four patty monster that contains two pounds of meat in total. 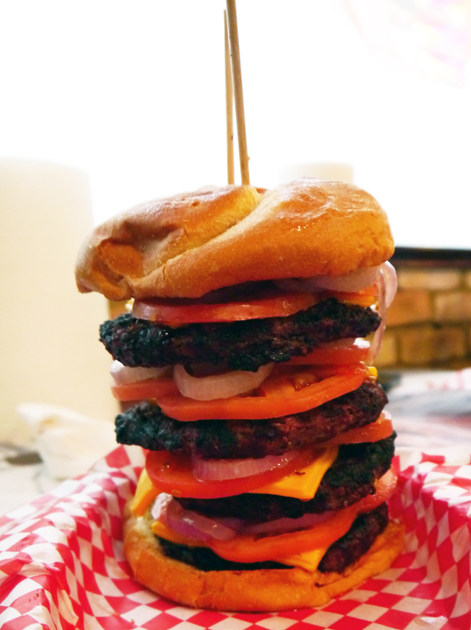 According to the Guiness Book of Records, this 10,000 calorie beast is the world’s most calorific burger. 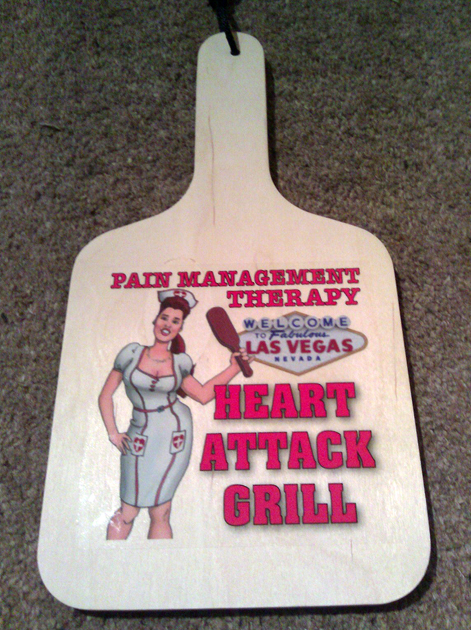 If you fail to finish it, or any of the other burgers, then the waitresses, all dolled up to look like nurses, will give you a spanking (and you can buy the paddle too if you like). According to our very friendly, chatty and flirtatious waitress, Nurse Rikki, 30-40 people order the quadruple bypass a day, but only two or three manage to finish the entire thing. Diners who weigh over 350 pounds eat for free (there are industrial-strength scales both inside and outside the restaurant), with one such chuffer waddling in behind us. Neither Templeton Peck nor I couldn’t bring ourselves to order the quadruple bypass, or even the two or three patty versions. We both opted for the single bypass burger which uses a single half-pound patty. I wasn’t expecting much from this burger, so I was pleasantly surprised by the offally, mildly tangy taste of the patty. It was a touch dry though and the slightly bitty grind is odd. The toasted bun does a good job of staying in the background and holding the entire sandwich together, while the vegetables are crisp and refreshing. I had my single bypass plain, but Templeton Peck chose to add some American cheese and five slices of very fatty streaky bacon. This much fatty pork naturally obscured the taste of the meat to some extent, but a well-judged balancing of subtle flavours is hardly the name of the game here. This might be a bad idea. Even the side dishes and drinks are ridiculous. Despite being fried in lard, the soft, squidgy fries topped with chilli beef are very bland. If there was ever a dish that tasted of colours, then this is it. This tastes of yellow and brown. 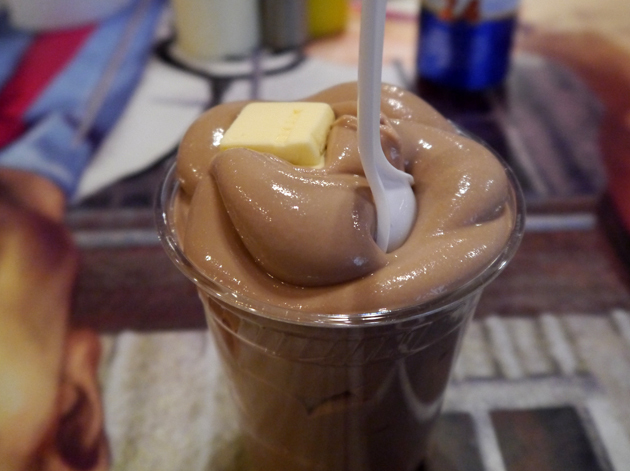 Similarly bland was the thick chocolate milkshake made with butterfat and topped with a tab of butter for comic effect. I could feel my arteries hardening with each slurp of the sludge-like mixture which didn’t even taste of anything. 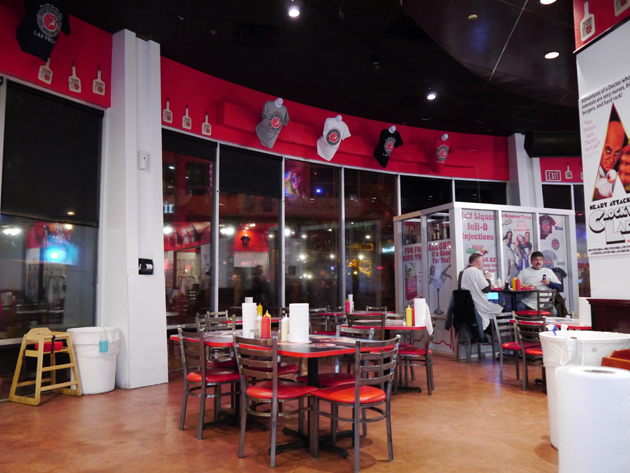 The Heart Attack Grill’s decor is suitably tongue in cheek. 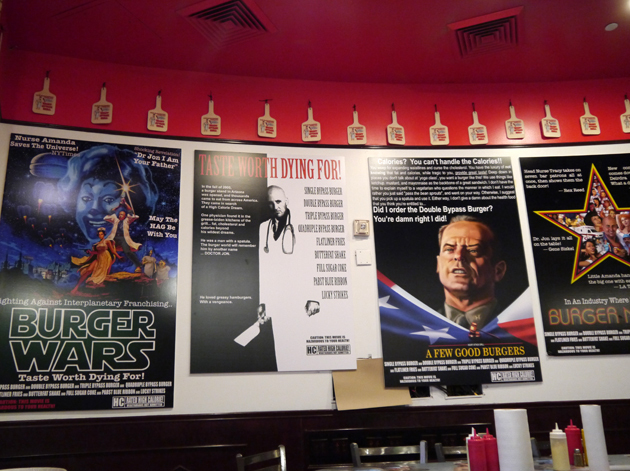 Spoof movie posters, from Burger Wars to A Few Good Burgers and 1,000,000 Calories B.C., line the walls, while news footage of the man who apparently did suffer a heart attack while dining here is proudly played on a loop above the bar. Even the receipts are stuffed with jokes. Formerly located inside The Venetian, this restaurant decorated in a faux graffiti style has now closed and, judging from my visit, not a moment too soon. Rattlecan served up a few hotdogs and salads, but my focus was clearly on its burgers. The place also had an extensive selection of beers from the usual suspects to some more unusual choices. Templeton Peck was pleased with his Magic Hat, a light and fruity beer from Vermont. I snacked on a bowl of dill pickle popcorn. Unlike the bland bone marrow popcorn from Dach and Sons back in London, this salty sack actually did taste like dill pickles although the lack of moisture spoiled the effect. 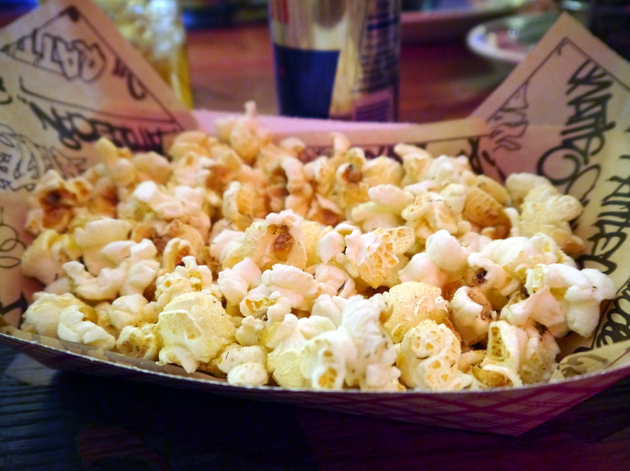 Depressingly though, the popcorn turned out to be the highlight of our meal. Pickle popcorn not pickled popcorn. 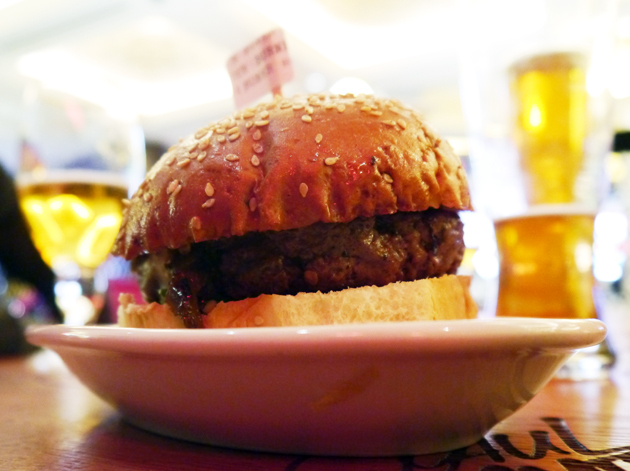 As usual, I opted for the simplest burger on the menu – in this case the Old School. Although billed as pink and juicy, the griddled patty was anything but – it was bitty, incredibly dry and heavily overcooked. Even the pickles, lettuce, onion and tomato (the latter three are served on the side) failed to add moisture to this distressingly cardboard-like slab of ‘beef’. 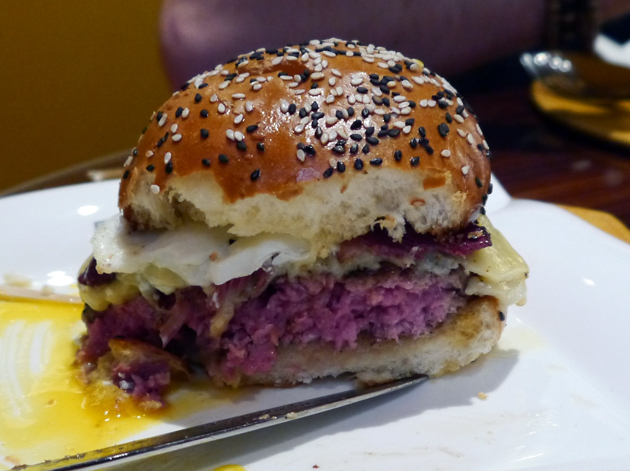 The sesame brioche bun didn’t taste like brioche at all and was instead inoffensively soft and bland. I had to slather this atrocity in Tabasco sauce, otherwise I wouldn’t have been able eat it. The worst burger I have ever had. Templeton Peck’s Burner burger used the same awful patty as the Old School, but was more edible since it was topped with roasted green chillies, jalapenos and a spicy sauce. The fiery fruitiness apparently proved sufficient enough to camouflage the appalling quality of the patty. Sadly, you can’t make out the spicy toppings on top of the patty in this burger. 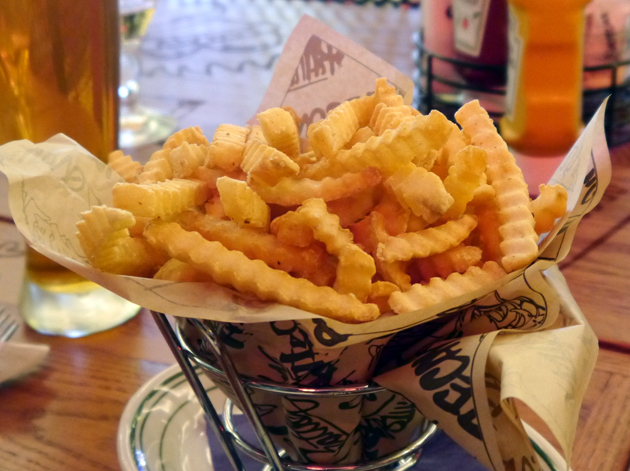 The plain crinkle cut fries were bone dry fingers of reconstituted mush rather than actual slices of whole potato. 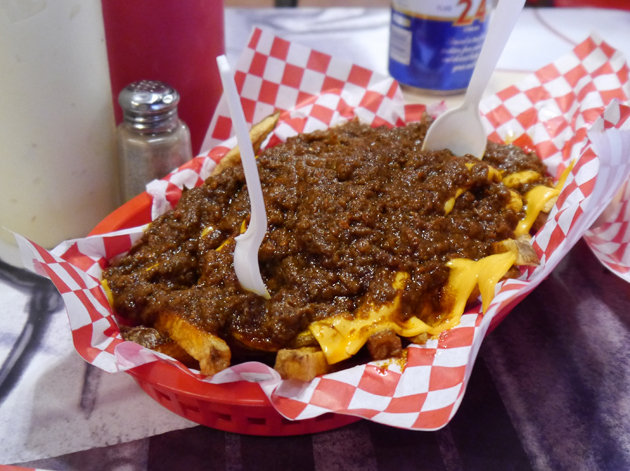 I couldn’t eat more than a few of these fries – they’re easily the worst I’ve ever had. They’re even worse than the fossilised kitty litter potato things served up at BurGR. The worst fries I’ve ever had. 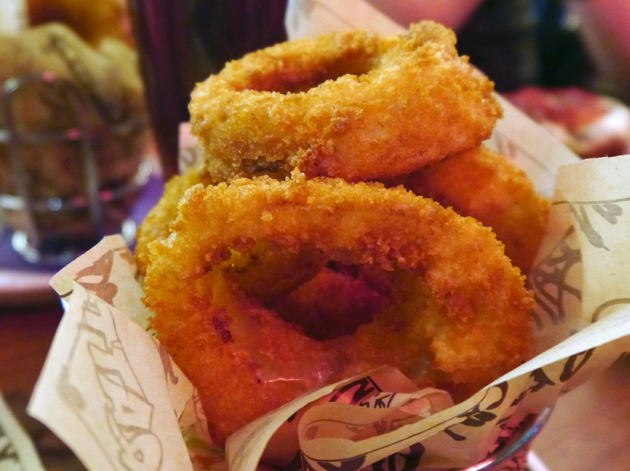 The onion rings were only marginally better. Although whole slices of actual onion are at the centre of each ring, the parched, crunchy, coarse batter is not only bland but it also obscures whatever taste the onions have. 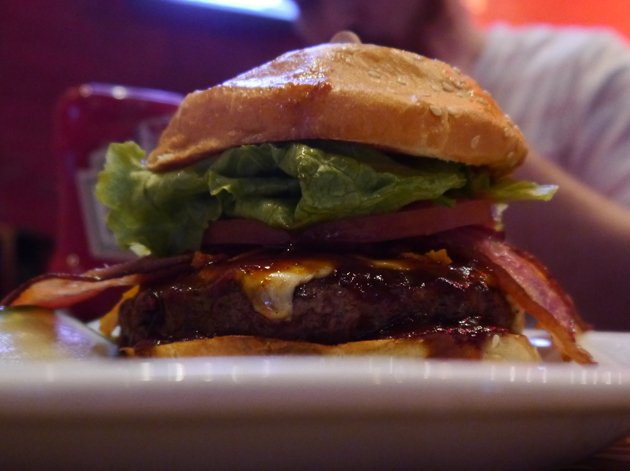 Of the five Vegas burger joints surveyed here, BLT Burger was easily the best although it still wasn’t perfect. The patty at Gordon Ramsay BurGR is surprisingly good, but poor construction and some very shoddily made side dishes detract from the overall experience. Burger Bar and the Heart Attack Grill aren’t too bad, but each has their own problems preventing them from challenging BLT Burger for the top shot. Rattlecan was simply appalling – I wouldn’t serve such food to an animal. I’m not sure if I’ll back in Vegas to try more burgers, so if you want even more Sin City burger reviews then check out the Vegas Burger Blog. Tags: blt, burger, burger bar, burgr, gordon ramsay, heart attack grill, las vegas, rattlecan, restaurant, review. Bookmark the permalink. I completely agree with your assessment of the fries served at Gordon Ramsay BurGR. They are the toughest steak fries I’ve ever tried to eat and they are quite dry. I ate there twice in the last week. I thought the burgers were excellent and would return for another but the fries were really bad. 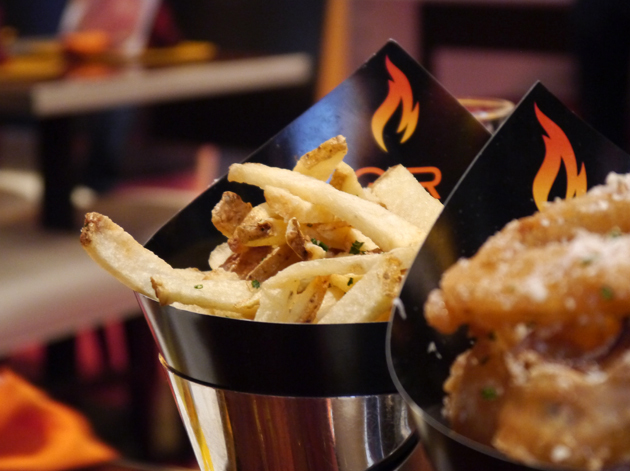 The fries look perfect but food has to do more than look good.